For Your Calendar: Hikes and Plenty More! This year’s SMGA / Bobcat Build project will remove invasive ligustrum from a 9-acre portion of lower Purgatory Creek Natural Area (Prospect Street entrance). Planning, documentation, and removal will increase watershed protection and water capture and enhance public viewing and use of the natural area. Minnette Marr a plant conservationist and San Marcos resident is consulting on this project. We are are looking for volunteer monitors for this effort. Email [email protected] if you can help. Taxes! Drought! Recession! Sheesh, can it get any worse? It’s enough to make you want to reach for some commiseration s’mores while sitting around a hibachi grill of hot coals with friends after an easy hike on a full moon evening. So let’s do it. Friday, tax day, 15th of April we will gather at Ringtail Ridge at around 6 PM for the hike, 7:30 for the s’mores. Bring your beverage, lawn chair and anything you wish to heat on the grill. We will provide s’more makings, water, and a table. Bring kids, stories, geetar or just show up. Call 754-9321 with last-minute questions. Aquarena Center. Help us promote the event’s theme of making responsible choices and incorporating practices “that meet the needs of the present without compromising the ability of future generations to meet their own needs.” The event is free and full of family fun, food, and music. More event info here. We are are looking for people to work for 1-2 hours in our booth. Email [email protected] if you can help. See details on our calendar. Please check back to confirm dates and times prior to each event. 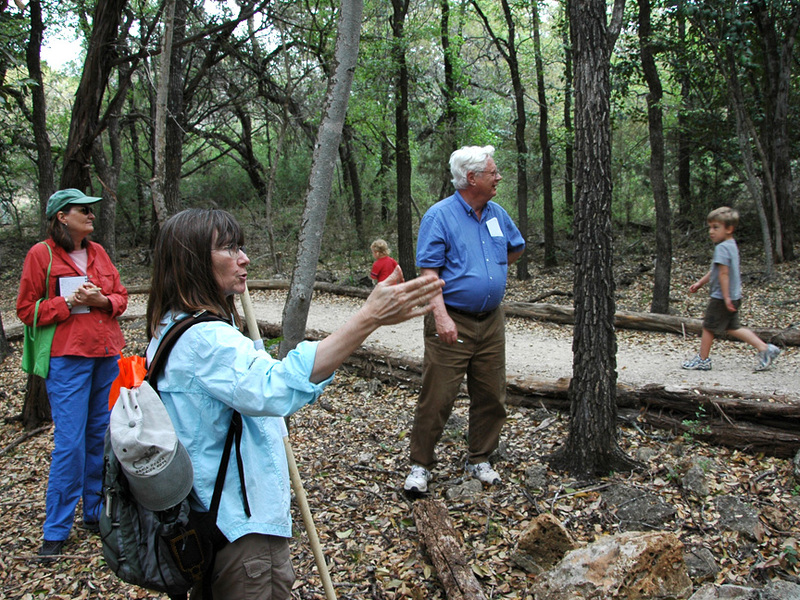 4/7, 21, & 28 TOWN Hikes: The Texas Outdoors Woman Network leads hikes every 1st, 3rd, and 4th Thursdays at 5:30pm in one of the many greenspaces around town. Email Judy at [email protected] to be added to the weekly hiking email list. 4/7 & 14 Keep San Marcos Beautiful Spring Concert Series: Vendors will open their booths at 6:30 p.m. Concerts located at San Marcos Plaza Park, 401 E. Hopkins. Featured bands are Carolyn Wonderland with special guest Adam Johnson & the Pay Me’s on April 7 and Devil’s Hollow with guest Jasper on April 14. Need more info? Call 512.393.8420 or email [email protected] Ask to get on the KSMB newsletter list to find out how to get involved in community cleanups. 4/16 Spring Tree & Plant Sale: San Marcos Nature Center, 9am-5pm. Check out the many native and low-water species available for great prices! 4/16 TXState E-waste Recycle Day: Bobcat Stadium parking lot, 9 am to 1 pm. Accepted items include computers, cell phones, printers, scanners, TV’s, gaming consoles, VCRs, DVD players, etc. Contact Sue Bruning at [email protected] with questions. They are NOT taking appliances, microwaves or household hazardous waste. Protect your identity and security by cleaning electronic devices with tools at http://security.vpit.txstate/edu/awareness/ecycling_idtheft.html. 4/23, 31 Invasives Removal: The San Marcos River Foundation works hard to keep our river and Spring Lake free of invasive plants that compromise the ecology of the river and its ability to support native species. Please email [email protected] to find out how you can help this effort. Experience our local waterways first hand in a boat or from the shore and get to know a great group of people! 4/25-26 Low Impact Development (LID) Workshps, Austin/Pflugerville: As urban runoff continues to be a significant burden to Texas waterways, implementing LID principles and practices allows water to be managed in a way that reduces the impact of built areas and promotes the natural movement of water within an ecosystem or watershed. Come learn how LID practices and policies can be implemented in your Texas community! More info here. 5/2 Riparian Workshop, San Marcos Activity Center: This day-long workshop will explain many topics of interest to landowners who live near creeks, streams, or the river (so that would be almost all of us! ), including erosion, vegetation, and the many quirks of waterways. Email [email protected] for more information. A $7-8 fee covers the lunch and is payable at the door. Afternoon river field trip included.